As it’s now December, I can just about bring myself to start paying attention to all the Christmas themed products that appear earlier and earlier each year. I should probably confess at this point that in my mind, “Christmas coffee” comes in the form of a Gingerbread Latte from Starbucks – with the obligatory whipped cream on top, obviously. So, can a mere ground coffee compete with that syrup-and-cream laden behemoth? 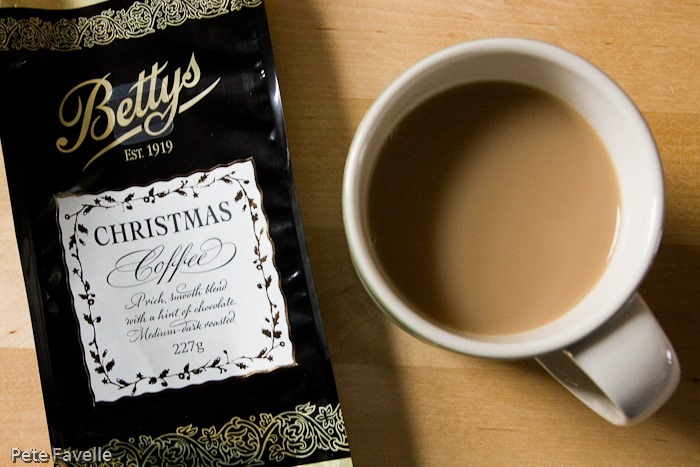 This is Bettys Christmas Coffee, a seasonal, medium-dark blend of indeterminate origin although the website is significantly more informative than the packet and tells us that the beans come from Java, Africa and Latin America. The aroma is certainly tempting; rich, black cherry fruit, a touch of bitter, dark chocolate and just a suggestion of burnt sugar – although for a Christmas blend, I’d have liked a touch of spice there too. Brewed, all the sweetness is lost and a more woody character becomes apparent, with notes of cardamom coming through. In the mouth, too, much of the sweetness of the grounds has been lost – in fact, all the flavours are surprisingly muted. There’s still a soft richness, with red summer fruits and a surprisingly full body – the finish is dry, more tannic than bitter which balances nicely with the soft flavours. It’s a tasty enough coffee, if a little understated for my taste and deserves 2.5 stars – however, it lacks any real christmassiness. Many thanks to Bettys for providing this coffee to sample.